Home Health Agencies Get Medicare's Star Treatment : Shots - Health News For the first time, the government is using a star system to rate agencies that care for seniors in their homes. Medicare was stingy with top ratings and also the poorest scores. Choosing a home health agency can be even more difficult than picking a nursing home. The federal government released on Thursday a new five-star rating system for home health agencies, an effort to bring clarity to a fast-growing but fragmented corner of the medical industry where it's often difficult to distinguish good from bad. Medicare applied the new quality measure to more than 9,000 agencies based on how quickly visits began and how often patients improved while under their care. Nearly half received average scores, with the government sparingly doling out top and bottom ratings. The star ratings come as home health agencies play an increasingly important role in caring for the elderly. 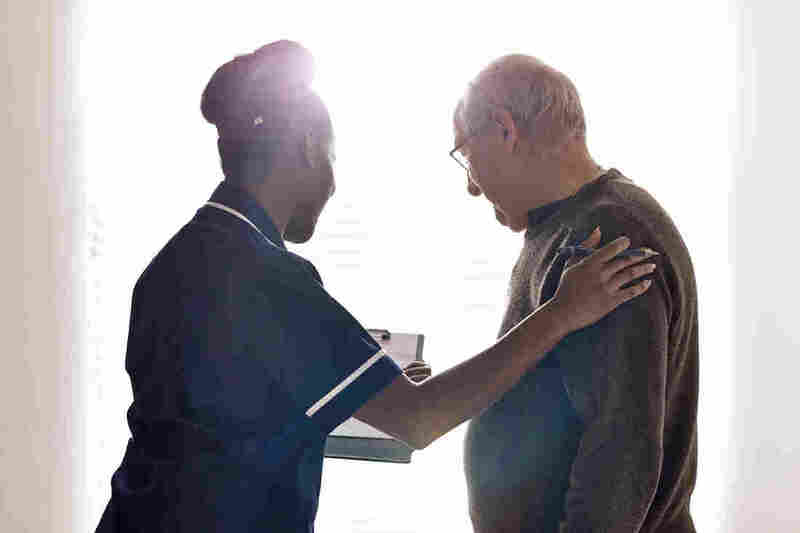 Last year 3.4 million Medicare beneficiaries received home health services, with nurses, aides, and physical and occupational therapists treating them in the home. Medicare spends about $18 billion on the home health benefit, which provides skilled services that must be authorized by a doctor. Housekeeping care isn't included, and some elderly pay for it privately. For both the government and patients, Medicare's home health visits are one of the least expensive ways to provide care, and the system has been especially susceptible to fraud. Assessing quality is often challenging for patients and their doctors, who must authorize the visits, often just as patients are leaving the hospital. The elderly tend to be less familiar with the reputation of home health agencies than they are with hospitals and other institutions. That makes evaluating quality particularly difficult for family members and guardians. "It's not like a nursing home, where you can go and walk around," said Dr. Cheryl Phillips, an executive at LeadingAge, an association of nonprofit groups focused on the elderly. "You can call the agencies and find out a little bit about them and their philosophy of care, but even for an informed consumer like me, you're kind of stuck with whatever your physician has ordered." Experts said the ratings could have substantial financial impacts on agencies, even driving some low-rated ones out of business. Hospitals, doctors and nursing homes may be reluctant to refer patients to agencies with fewer than three stars. A total of 2,628 agencies — 28 percent of those Medicare evaluated — received those below average ratings. "It's a very fragmented, competitive market in a lot of metropolitan areas," said Lilly Hummel, a manager at Avalere, a health care consulting firm in Washington, D.C. "It could get difficult for home health agencies that, for whatever reason, aren't doing well on the star ratings." Medicare intends eventually to pay bonuses and penalties to agencies based on performance, as it does for hospitals. More than 12,000 home health agencies take Medicare, including local for-profit shops with just a few employees, nonprofit associations of nurses, hospital affiliates and subsidiaries of publicly traded corporations like Kindred Healthcare and Amedisys. Medicare assigned stars to all but 2,902 agencies that did not have enough patients to evaluate, had only started business recently or did not provide enough data. Among those Medicare did rate, 46 percent received 3 or 3 1/2 stars. Medicare gave the top rating of five stars to 239 agencies while 195 agencies received 1 1/2 stars. Only six agencies received a single star. "What this indicates to us is a large proportion of home health agencies are performing reasonably well," said Dr. Kate Goodrich, who directs the quality measurement program at the Centers for Medicare & Medicaid Services. There was a wide variation in scoring among types of providers, a Kaiser Health News analysis found. Visiting nurse associations and agencies with religious affiliations tended to get the most stars. Home health agencies run out of skilled nursing homes and agencies run or paid for by local governments tended to perform poorly. A third or more of home health agencies that Medicare rated received four or more stars in Alabama, California, Florida, Maryland, New Jersey, Pennsylvania, Rhode Island, South Dakota and Utah, the KHN analysis found. The highest proportion of one or two star agencies were in Alaska, Arkansas, Minnesota, Ohio, Oregon, Texas, Wyoming, and the District of Columbia. In those places, four out of 10 agencies or more received less than three stars.